LINCOLN, Neb. – The Arkansas men’s golf team was down two strokes after 18 holes but answered with a 7-under-par round in the afternoon to win the Git-R-Done Husker Invitational by 19 strokes with a one-day, 36-hole total of 657 (290-277). The six-team event was a late addition to the Razorbacks’ schedule and was played Saturday at Firethorn Golf Club (par 71, 7,025 yards). In addition to the team win, Tyson Reeder claimed his first collegiate medalist honor, shooting a final-round 69 to tie South Dakota State’s Jared Nicholls for first. Reeder was tied for fourth after an opening-round 71 but carded a 2-under-par round in the afternoon for a total of 140 (71-69). Reeder will enter the 2019 SEC Championships as the Razorbacks’ hottest golfer as he shot a career-low 207 – 9-under par – to finish a then career-best third last week at Augusta. He has two top-three finishes over his last two outings, is 11-under-par and has shot par or better in four of his last five rounds. With the win, head coach Brad McMakin has led Arkansas to 27 tournament titles, including 22 during the last nine years, and at least one tournament win in each of his 13 years as the Razorback mentor. Reeder marks the third Razorback to win an event this season, joining William Buhl (Gopher Invitational) and Julian Perico (Jerry Pate National Invitational). 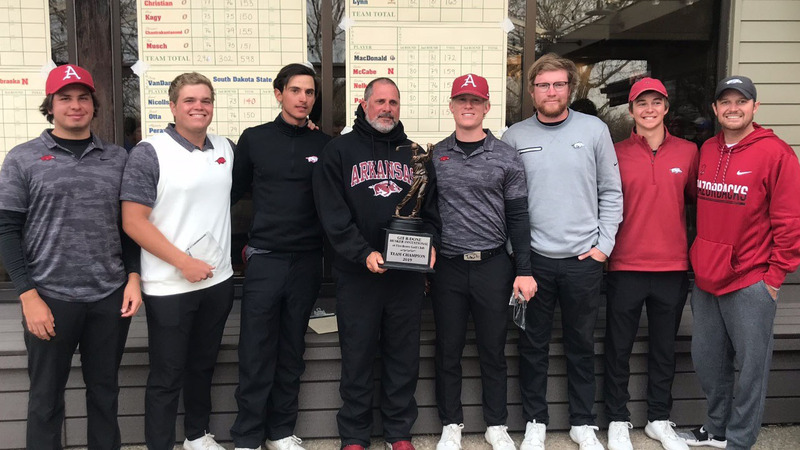 Arkansas put all five golfers inside the top 10 including Reeder (T1st; 71-69-140), Mason Overstreet (3rd; 72-69=141), Perico (T4th; 75-68=143), Luis Garza (T6th; 73-72=145) and Buhl (T6th; 74-71=145). Wil Gibson, playing as an individual, finished tied for 20th (76-77=153), his second career top 20 finish. Reeder opened the event with a bogey but had birdies on holes 8 and 9. He dropped a shot on the par-3, 13th hole before closing with five pars for an even-par round of 71. In the afternoon session, Reeder had four birdies and two bogeys to finish with a 2-under 69. Overstreet earns his second top-5 finish of the season and fifth of his three-year career. The junior birdied his opening hole of the day and had three for the round through 12 holes to stand at 1-under. He dropped a pair of shot on holes 16 and 17 to finish at 1-over. In the afternoon, Overstreet was 3-under thanks to a birdie on hole five and one of the two eagles for the event, holing out on his second shot on the par-4, 10th hole. He suffered a bogey on the 15th hole to finish with a 2-under 69, his 23rd career round in the 60’s. Perico had 15 pars, two bogeys and a double in the morning round for a 4-over 75. However, he jumped 12 spots on the leaderboard in round two, carding a 3-under 68 thanks to four straight pars on holes 8, 9, 10 and 11. He also ended his day with a birdie. Buhl and Garza each recorded their second top 10 of the season, tying for sixth. Buhl shot a 74 in the first round but moved up four places with an even-par round off 71 thanks to two birdies, two bogeys and 14 pars. Garza shot an opening-round 73 and climbed two spots to finish tied for sixth thanks to a final-round 72. Overstreet, Reeder and Perico each posted an event-best 26 pars over 36 holes, while Garza had 25. Reeder added six birdies while Garza, Perico and Buhl each had five. Overstreet had one of the two eagles at the event. Arkansas will now turn its attention to the 2019 SEC Championships (April 24-28) in St. Simons Island, Ga. The NCAA Regionals will be May 13-15 before Arkansas hosts the 2019 NCAA Men’s Championships May 24-29 at The Blessings Golf Club. Arkansas and the Blessing Golf Club will also host the 2019 NCAA Women’s Championships May 17-22. Firethorn Golf Club • Lincoln, Neb.